The Mahlke Chronicles: Alphabet: M & N.
A weather system that results in record-breaking cold temperatures. Can also be used as euphemism for "really f*ing cold" or "f*ing freezing." Schools are closed because the polar vortex dropped temperatures below zero F.
My heater broke, now my house is a polar vortex. -As provided by the Urban Dictionary. I don't much like the Urban Dictionary's word of the day for January 8th. It's a term I wish never made its way into my vocabulary. Moreover, I wish I never experienced it. Winter in Minnesota is bad enough. If you were lucky enough to be outside the reach of this awful stretch of insanely cold weather, try wrapping your mind around this number: -50 degrees Fahrenheit. You can't, can you? I'm still trying, and I felt it. Well, felt it is a little misleading since the boys and I never actually ventured outside on January 6 and 7. The governor cancelled schools, so we hunkered down at home and tried not to drive each other crazy. What's one to do when you're prisoners of your home? Projects, of course. We resumed our alphabet series that had been on hiatus due to the holidays. We snuck in the letter M before the hiatus, so we focused on N this week. Tracing hands for moose antlers. Moose for their bedroom door alphabets. Monster drawings: glue googly eyes on plain sheet of paper and then draw monsters around them. Mud playdoh. Follow a homemade playdoh recipe and add coffee grounds. M&M patterns. Make pattern, eat, repeat. Nest for their bedroom door alphabets. We also YouTubed birds making nests; and, upon Spencer's request, birds hatching out of eggs. 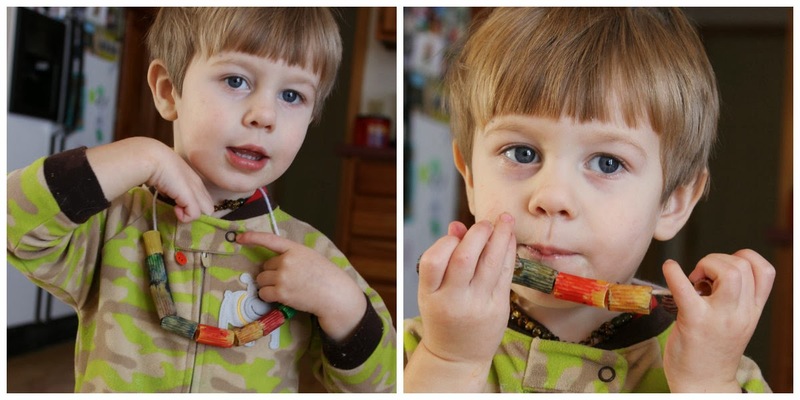 Painted noodle necklaces. They lasted all of a few hours before Ashton chomped all the noodles off, some making their way into his tummy. It wasn't intended to be an edible necklace, but whatever. Name tracing with stickers. For Ashton, I asked him to put the sticker on whatever letter I dictated. Spencer had to put the stickers on the letters following the given pattern.